Clitheroe extend perfect record in the league to five games! 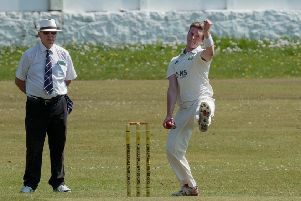 Champions Clitheroe resumed the Ribblesdale Cricket League’s natural order after climbing back to the top of the table. While challengers Settle slipped up for the second time this year with a 43-run loss to Read at the Marshfield Ground, Paul Gaskell’s side extended their perfect record to five games with victory over Great Harwood. The league leaders are looking to become only the second club in the division’s history to register three successive titles following Read’s dominance from 2002. And their crown never looked like slipping when Russell Whalley’s men arrived at Chatburn Road. Professional Janaka Gunaratne reduced the visitors to 111-9 leaving Peter Dibb to steer Clitheroe home by six wickets with an unbeaten 45. That momentum extended in to their LCB Knockout Cup clash against Star XI CC just 24 hours later. Last season’s semi-finalists culminated the innings on 229-8 before their Sri Lankan paid man Guneratne took care of the rest with a five-wicket haul to seal a 144-run triumph. They’ll now face Liverpool and District outfit Leigh CC at Beech Walk in the second round on June 14th. Meanwhile, spectators are being asked to wear pink for the club’s charity Twenty20 derby against Waddington CC on Friday, June 5th. Gates for the fixture, which is in aid of Cancer Research, will open at 5-45 p.m. while local firms Dawson’s and Bowland Brewery will be supporting the event. The town centre department store has vowed to donate £5 for every boundary hit by the two rivals on the night. Those who turn up will get a first glimpse of the Bowland Beer Bus - a converted Dalmler GV6 London double decker which now serves as a mobile bar. Happy hour runs from opening with cans available from £1 and a BBQ will also be provided. Afterwards entertainment in the renovated clubhouse will be provided by local band Fret 64. All profits made on the gate will be donated to Cancer Research.